This blog was born out of a combination of my love of food, and my love of this city, and the "perth has nothing" meme to which most everyone subscribes at some point. I still love this city, and I still love food, and people still subscribe to this meme. 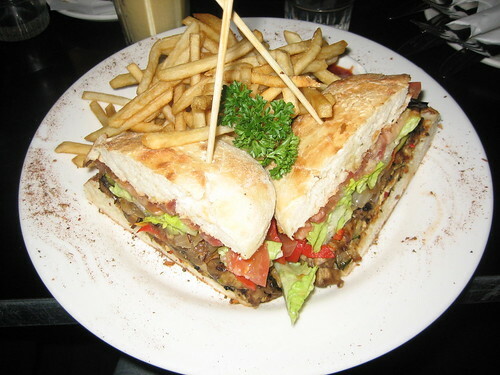 I don't intend to stop blogging about awesome vegan food and products in Perth but, at least for a little while, the Perth-blogging is going to be a bit less. Later this evening D and I are getting on a plane to Melbourne, and we're going to be veganing around a different town for a while. Like, the movers emptied our house and put it in a c-tainer to transport sort of a while. I went for the moon veggie burger (with no pesto). It was deliciousness, and the chips were great. The mushroom inside was especially tasty. 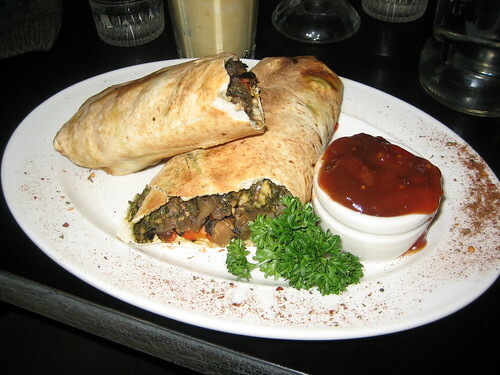 D ordered a weekend special, a grilled eggplant wrap (without the feta and pesto). D declared it delicious, though without the pesto it was a tiny bit dry. We both ordered a mango fruit smoothie with soy milk and (sadly) ice instead of sorbet, and it was pretty good! Oh the Moon, I love you and your late night pretension. Went out for brunch this morning with Sheebaface and Dr A, and because I have never been there and has long been considered quite fancy and expensive, I wanted to try out The Witch's Cauldron in Subiaco. There was a table available, and we started with complimentary mint lemonade, which was interesting (S loved it, she stole D's). Both D and I ordered the veggie big breakfast. Non-vegans ordered amazing pieces of art, french toast that was five centimetres thick and pancakes that looked like scones, so I was looking forward to what we'd ordered. 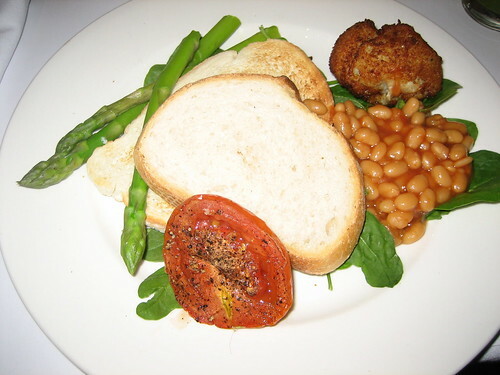 The veggie big breakfast was good, I quite liked the asparagus (and I don't usually like asparagus), and the potato cake was really tasty. However, when I ordered the veggie breakfast with no eggs and dairy, I expected to be losing the eggs, I didn't expect to lose the mushrooms with no warning. Being told the mushrooms are soaked in butter seems like usual service (though being offered something else - like at Blue Waters Cafe is super awesome), but not being told at all is not cool. So in conclusion, the food was delicious, but the experience was nothing awesome. Hanging out with Sheeba + Dr A was pretty awesome though! 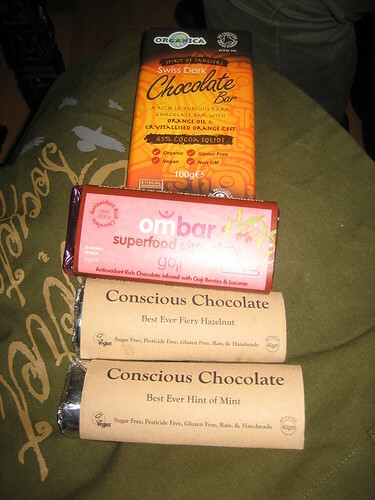 It was my birthday a couple of weeks ago, and I received a whole lot of chocolate. 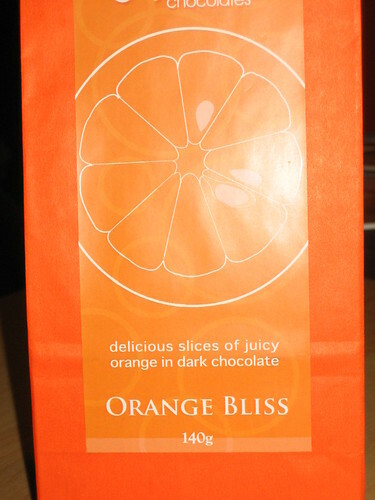 My parents gave me this awesome chocolate-coated oranges, which we nommed straight away. Sheebaface picked up these from PAWS, I look forward to future nomming. We had some Tofutti better than cream cheese (or lie-cheese) that we needed to get rid of, and a whole lot of tofu for the laksa, so I made a lemon cheesecake for dessert on Tuesday night when Sheboodle and Dr A came to visit. 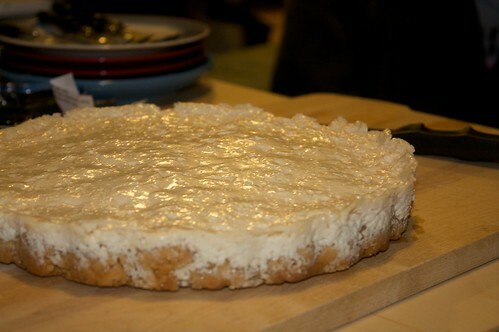 I was concerned I had over-lemoned the cake, but it was just the right combination of tart and sweet. I did overdo it on the base, which ended up quite thick, alas. I can't give this as a recipe yet, because the measurements are completely guesswork, due to all of our measuring cups having already been packed. I also had to borrow a silicon tart tray from the awesomepants CGB, as all of my baking dishes have also already been packed. So I'm not sure what measurements will fit into my usual cheesecake pan. I will just have to make it again! It's been cold and rainy and I've been on my own, so I indulged in one of my favourites, claypot noodles. I'm not sure why I continue to order claypot in restaurants, they never taste quite right. This time it was deliciously soupy (I used a bit more stock), a little over-soy sauced, but so very delicious. And it's so great to make a whole lot extra, and then be able to eat comfort food at work. 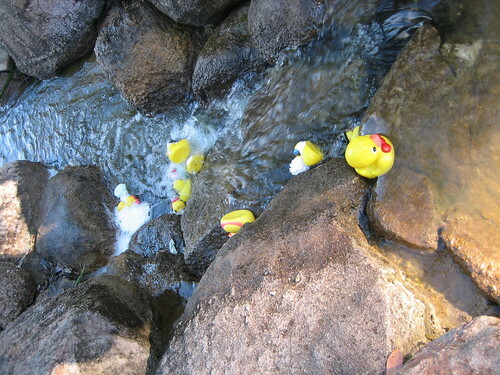 Last week I went ducky racing with some friends, to celebrate Jorge's birthday. After the duck races, we went for a meander through King's Park, traipsing across the sky bridge and pausing for a cupcake break (provided by Dr G and Gilli). Later, after criticising/rewatching the first Harry Potter movie, a large group of us meandered down to the Broken Hill Hotel, in Vic Park. There was nothing on the menu suitable for vegans, but Kandy had asked when booking, and they had said they would be happy to cater for me. And they were! When I asked, there were three options available for me, about which I was quite chuffed. I went for the ratatouille and coconut rice, it was nothing super exciting but it was a perfectly serviceable pub meal, and they were very helpful (and the chips were delicious). When I'm feeling lonely I tend to do a lot of baking and cooking. I opened Vegan Indulgence twice this weekend, once for melting moments and once for chocolate berry cake. I love both of these recipes, even though something went wrong with the cake and it became fail cake (still delicious!). 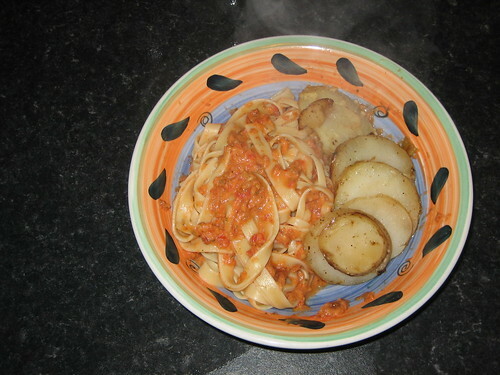 Saturday night dinner on my own: scalloped potatoes and a pasta served with a raw tomato sauce. I had never cooked scalloped potatoes before, so I was very intrigued to give it a try! This was the focus of my cooking for Saturday night, but I wanted something else to go with it, for although potatoes are very delicious, they are not really a meal on their own. 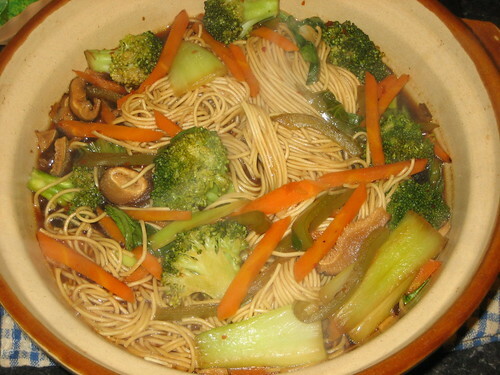 The sauce was based off a recipe in New Asian Traditions. It was made up of two tomatoes, roughly chopped, with a small handful of sun-dried tomatoes, and some oregano and basil, all blended together. I tossed this through the drained pasta fresh off the stove, so the sauce warmed but was still raw. It was awesome! Not as super awesome as the scalloped potatoes though, I was very happy with them. 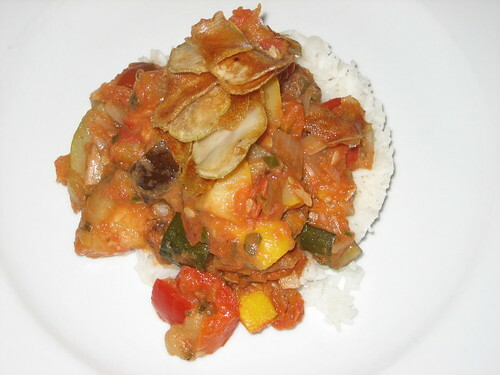 This made three serves of a side of potatoes – I could have used a tiny pot but I loved the idea of potato left overs. Wash the potatoes, and slice into thin circles. Dice the onion. In some nuttelex/marg, start to fry the onion, then add the garlic and the potato. Continue frying for about ten minutes, or until the potato starts to brown. In the meantime, blend together the cashews, nutmeg, savoury yeast flakes, flour, water, soy milk, salt and pepper. 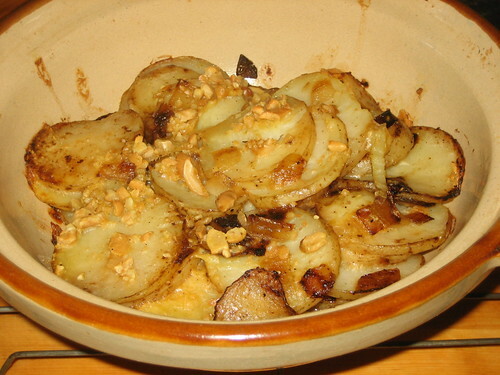 When the potato and onion is ready, put into a baking dish, and pour the sauce mix over the top. Mix slightly if needed. Cover and bake at 200C for about thirty minutes, then remove the lid and bake uncovered for another ten minutes. I have this terrible habit of buying a bag of oats for one recipe (using one cup or something), and then never using the rest and then the pantry gets infested with moths, hanging out in my bag of oats. It was only three weeks ago, when I was in Kakulus buying a single cup of soy flour, that I realised I should have been buying my single cup of oats from there. 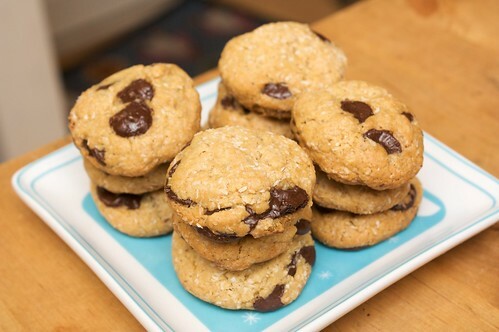 Anyway, I've been trying to use up my latest really large bag of oats, so one night last week I used oats in both dinner and dessert, and I was very pleased with myself! 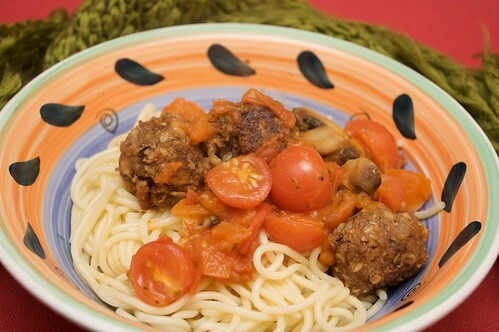 For dinner I made these absolutely delicious pecan and walnut balls, which I served with a cherry tomato sauce. I mostly followed this recipe for the balls, modifying a little bit here and there, and I did also skip the gluten flour. 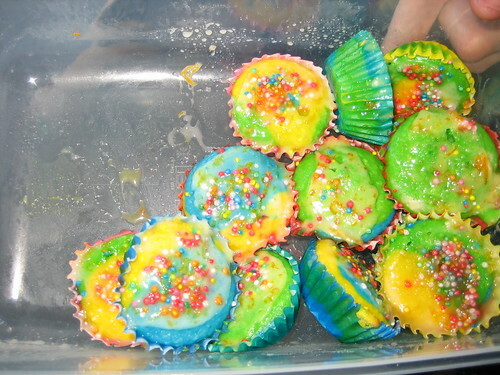 These were really tasty, they were a little time consuming but absolutely worth it, they were so good. Also they used up a cup of oats. The cherry tomato sauce was awesome, I made my usual nepolitana sauce, and in the last three or four minutes of cooking I added about a dozen or so cherry tomato halves. They wilted slightly in the heat, but not enough to start cooking, and it was a great complement to the pecan and walnut balls. A++ will cook again! 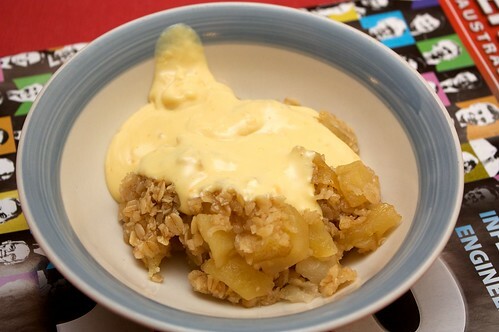 For dessert I tried out this apple and pear crumble. I changed the proportions a little bit, and served it with some warm custard. And it used up more oats! D is heading off to a conference tomorrow, so I baked these for in-flight nomming. They will possibly (POSSIBLY) also be for sharing with D's colleagues, but although I baked two containers worth, it's a long flight, the biscuits might not all survive for arrival. 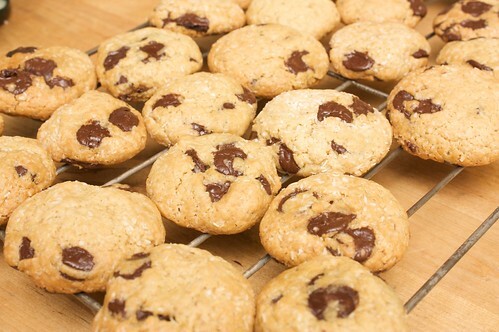 Be careful not to overbake these! They should be slightly golden on the base of the sides. They will still be soft when you pull them out, this is okay because they harden a little as they cool. Combine linseed and water. Leave to sit for ten minutes, then stir well for about five minutes. 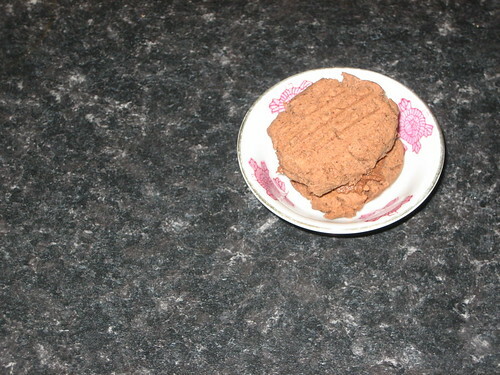 In a large bowl, beat together linseed and water mixture with applesauce, nuttelex, castor sugar and raw sugar. Mix well, then stir through vanilla essence, hot water, and soy milk. In a smaller bowl, combine flour, baking soda, and salt. 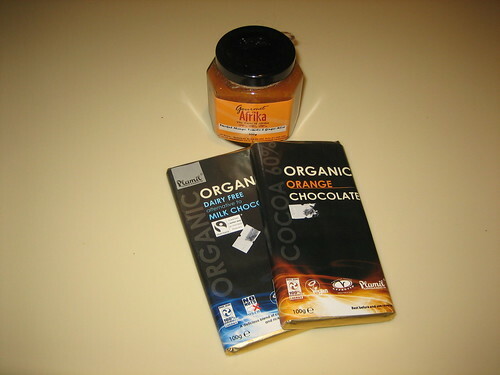 Mix into the liquid mixture, then add choc chips and coconut flakes. Mix until they're all well combined. Roll into balls of about three centimetres in diameter, and dollop onto lined or greased baking trays. Keep the balls at least three centimetres apart from one another. Bake at 195C for about fourteen or fifteen minutes. 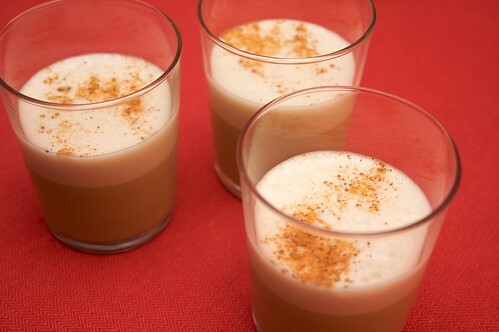 CGB came over and brought with her the makings of brandy alexanders. I'd never had them before, and they were delicious! They're not normally vegan when you order them, but she subbed in soy milk. Fabulous! And now I'm humming the Feist song of the same name.